Call 949.221.0010 to Apply Today! Please fill in at least one of the fields below and click "Find" to locate your shop. Official GT-R certified Signage for Dealers and sponsored independents. Business development process and feed-back to ensure your shop continues to have what it takes to properly repair the new generation of GT-R Vehicles. 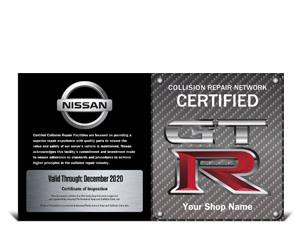 Leveraging the exclusive GT-R Certified status to promote and market your shop. Listings and Referrals on all consumer and insurance facing body shop locators and smart phone apps. Marketing campaign to GT-R Customers on the GT-R Certified COllision Care Provider in their area. Elite welcome kit that includes GT-R Certified marketing material. The new GT-R Certified Repair Network is an elite Certification program that enables GT-R Dealerships and qualifying independent body shops to become officially certified by Assured Performance Network on behalf of Nissan North America. learn about the design and construction that is unique to the GT-R.
take a detailed look at the GT-R body repair manual and procedures. identify the construction materials on the GT-R.
understand the repairability of the GT-R structural materials. be measuring to find damage using electronic measuring. develop a repair plan on a damaged GT-R.
perform hands-on aluminum panel repair. setup a repair bench to understand anchoring and pulling options. perform hands-on steel joining using (GMA) MIG and spot welding. understand the unique refinish processes for the GT-R.
Review the terms and conditions of participation and select the application option. Then, see the amount due and select your form of payment. Enter key business information critical for KPI comparisons, program review and tracking. 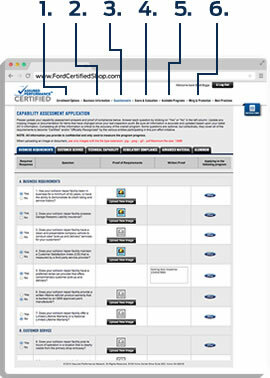 This step provides the list of requirements and standards your shop must meet. The question and answer process allows you to assess your capabilities and create a business development plan, if necessary. As you go through the process, you can assess whether or not you will be able to make the grade. If not, you can make any business improvements necessary before scheduling an onsite inspection-audit.This is critical to help ensure the fit, finish, safety and performance of the vehicle. The online system provides you with a score and illustrates any deficiencies in becoming Certified or Recognized. It is part of the ongoing business development process. When you are sure you can meet all of the requirements, the next step is to schedule an on-site inspection-audit. The inspector will tour your body shop and ensure proof of compliance with photos and documentation. To ensure your shop gains value from Recognition, various marketing and promotional tools are available. Shops must upload images and logos to personalize the optional marketing materials. ©2019 Get Nissan Certified. All rights reserved.